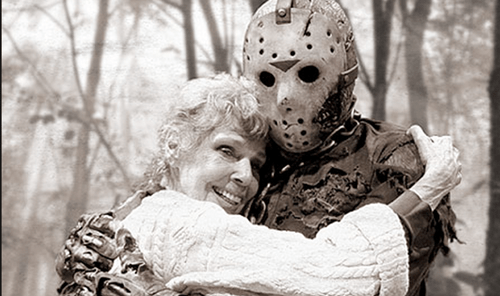 Pamela Voorhees (whose maiden name is never revealed) was born in 1930 (revealed in Friday the 13th: The Final Chapter). At age 15, Pamela became pregnant by a man named Elias Voorhees. Very little is known about their romance and short marriage, aside from the fact that Pamela kept a class ring which belonged to Elias which she then wore on her ring finger of her left hand (as seen in the first Friday the 13th film). On June 13, 1946, at age 16, she gave birth to a hydrocephalic boy she named Jason, as shown in Jason Goes to Hell: The Final Friday. Because of his deformity, Pamela never sent Jason to school, and was extremely overprotective of him. Pamela got a job as a cook at Camp Crystal Lake. On a fateful day in 1957, Jason, infuriated with the constant teasing from other children, sneaked out of his cabin late at night to prove he could swim. The counselors were not watching him, as they were at a party in one of the adult cabins. Jason was never recovered from the lake and presumably drowned. Pamela blamed the counselors because she was working the day that it happened. After her son’s death, Pamela began hearing her son’s voice telling her to kill the people who were responsible for his death. In 1958, a year after Jason’s death, Pamela brutally murdered two counselors (Barry and Claudette) who she felt were responsible for her son’s death. Camp Crystal Lake was closed after the murders and was nicknamed “Camp Blood” by local residents. When the owner tried to re-open the camp in 1962, Pamela returned, poisoned the water, and set several fires. The camp was shut down once again and did not reopen until 1979. Pamela lived in a house which bordered the Camp Crystal Lake property. InFriday the 13th, it is revealed that no one knew who set the fires or poisoned the water. In Friday the 13th, Pamela says she does not want the camp reopened because she fears that another tragic accident will happen. The sole survivor, Alice Hardy, discovers two of the murdered victims and later meets Pamela, who tells her about Jason’s death. Pamela flies into a rage and chases Alice around the camp with a machete, saying “Kill her, mommy!” in Jason’s voice. Finally, Alice is able to take Pamela’s machete and decapitate her. NOM’s Brian Brown Invades Utah – Lock Up The All You Can Eat Buffets In SLC!